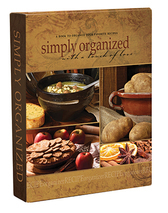 Simply Organized offers two ways to organize your recipes. Option # 1 allows one full recipe to fit on each side of the card. 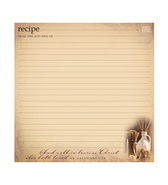 Allows you to read the complete recipe without removing the card or turning the page with messy hands. 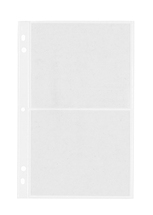 1a Two 5 x 6 cards will fit on one page. 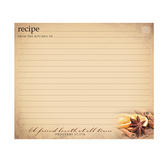 Most recipes can easily be written on each side of these cards. 1b One 4 x 6 card and one 6 x 6 card will also fit together on one page. This page works well for recipes that are long and can be teamed up with a short one. These three sizes of cards are printed for a recipe on each side. 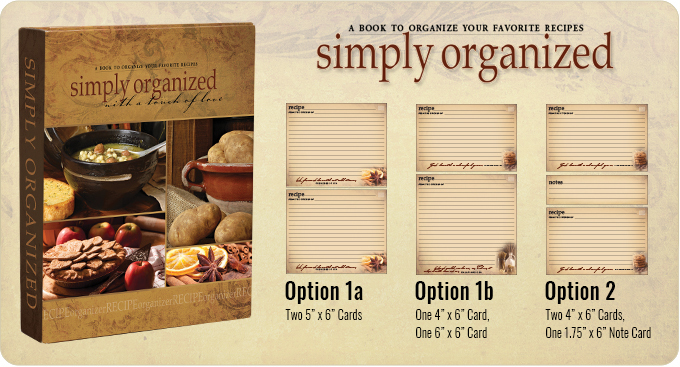 Option # 2 uses the standard 4 x 6 cards and two will fit on one page. These cards have additional lines on the back for your longer recipes. 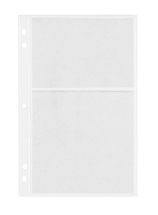 A small 1.75 x 6 pocket in the middle gives room for any notes you wish to add. 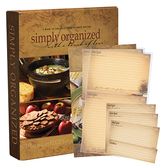 Includes tab dividers and five each of the three different sleeves with accompanying recipe cards. Goes with Option 1b. Each side is a different recipe. Goes with Option 2. The space for the recipe flows to the back of the card. Goes with Option 1a. Each side is a separate recipe. Goes with Option 1b. Each side is a separate recipe. 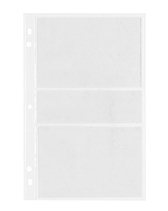 Just the binder—no recipe cards or sleeves. This single page pocket is a necessary catch-all for the items that won't fit in any of the other size pockets.